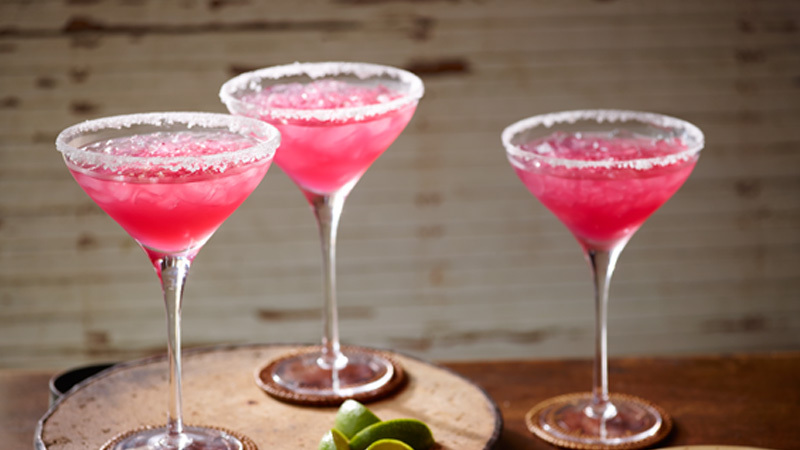 Treat your guests with these wonderful margaritas made using cranberry juice, tequila and lime juice– a delicious cold drink. 1. In a large saucepan, heat the sugar and water over a medium heat, until the sugar has dissolved. Remove from heat and pour into a large heatproof jug. Cover and chill in the fridge for 20 minutes. 2. Add the lime juice, tequila, liqueur and cranberry juice to the sugar syrup in the jug and mix well. Chill in the fridge until ready to serve. 3. Rub the rims of margarita or lowball glasses with lime wedges, then dip the rims in salt. Fill the glasses with crushed ice and pour the margarita mixture over the top. Garnish with lime wedges. Other juices would work well in this recipe too. Why not try raspberry or tropical fruits. Stir through some flavourful herbs for an aromatic twist. Why not try mint or basil?